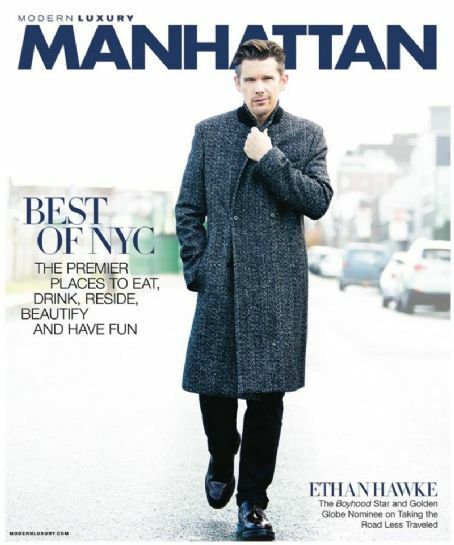 Hawke appears on the cover of the January/February 2015 issue of Manhattan magazine. He talks about taking the road less travelled. 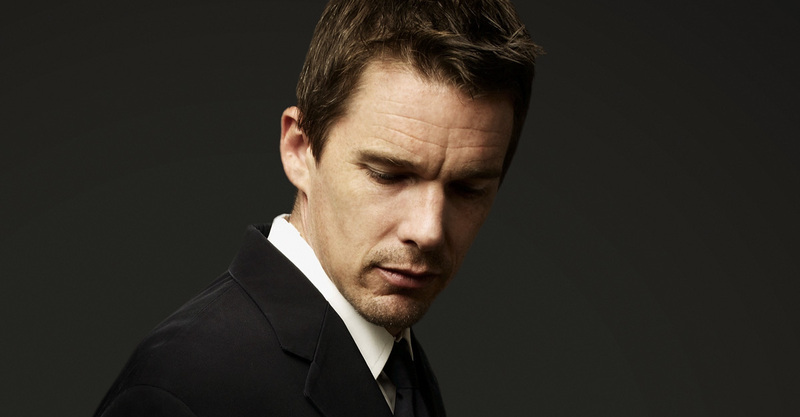 Jimmy speaks with Hawke about his movie Boyhood on The Tonight Show Starring Jimmy Fallon. Seacrest interviews Hawke during On Air With Ryan Seacrest and questions him about his film, Boyhood. We did a little big every year. I went to Austin and we’d rehearse and workshop and meet the kids again and see what was going on in their lives we’d shoot for three or four days and then I’d go away for a year. And we’d find time to meet again the next year. Elle Magazine interviews Hawke about the romantic characters he plays and if real women expect him to be like those characters. I can’t tell you how many times in the ’90s I’d meet somebody, we’d be having a nice time, and they’d sigh and go, “This is exactly like Before Sunrise.” And I’d have to get up and leave. Hawke gives an interview to The Talks. He discusses what he expected the film business would be like, selling out, and whether he will be in the film business forever. I don’t know. It’s been a lot harder than I thought it was going to be to make the films I really dream of making. I was in Italy a few years ago scouting for this very beautiful film I wanted to make with Richard Linklater. We worked really hard on the script for a couple of years and couldn’t get the money together. It was an expensive idea. It’s heartbreaking when that happens over and over again and then the movies that do get made are ones that have lots of women being beaten up or zombies being killed. Hawke plays federal agent Jack Valentine in this crime drama directed by Andrew Niccol. Valentine is hot on the trail of the world’s greatest arms dealer, now all he needs is the evidence to prove it. When Valentine finally gets the break he was waiting for, his superiors have a nasty surprise for him. Also starring Nicolas Cage, Bridget Moynahan and Jared Leto. The devil is seductive, and so guns are glorious in the culture. I understand there’s a case to be made. For instance, Spike Lee said something like this, that you can’t have a scene with drugs in a film that doesn’t secretly make you want to do drugs. In the same vein, it’s hard to make a movie that’s anti-violence because the very nature of photographing violence eroticises it. But I’m not so sold that that’s true. In this police action thriller directed by Antoine Fuqua, Hawke plays officer Jake Hoyt on his first day at a new police precinct. His training officer has quite a day in store for him as they travel back and forth across the city leaving murder and mayhem in their wake. Also starring Denzel Washington and Tom Berenger. Training Day was my best experience in Hollywood. And a lot of that you have to give up to the fact that, pure and simple, Denzel Washington is a great movie star. Each generation there’s two or three – and he’s it.